JC: How do you define yourself as an artist? Do you have a term, or label you use in passing conversations? TS: Less a straight line, more an inimitable scribble (I’ve used that one before). JC: If so when and how did you arrive at that label? TS: It’s very hard for me to just say “I’m a dancer” cause I dabble in all sorts of things, from make videos to playing music…anything that inspires me. But even though haven’t danced nearly as much lately, I have trouble not including “dancer” because it defines me and all that I do. JC: How long have you been living in New York now? How has that experience been for you? TS: Nine years. (One more and I get trophy, right?) I always refer to my experience in NYC as “grad school”. But, just like living in Florida, I live in the “house” everyone wants to visit and be a part of, yet harshly judge. NY has broadened my cultural awareness and critical thinking, weathered my tough skin, taught me change is inevitable and therefore bestowed me with patience. For a small town girl to come to the Big City, and lasted this long, she must have grown significantly and found some niche to call her own. JC: I know you travel often where have you been currently? How or did it move you? TS: I have been to Norway twice this year. That’s pretty unbelievable, I think, and fortunate. I am on a “simplify life” kick, as are a lot of people these days. Oslo was my first stop and I have to say: another city, another bore. Sorry, Oslo. There was one too many H&Ms. From Oslo I ventured north along the fjords; the small towns, the dramatic and unspeakable beauty of the mountains. There I found real hope, peacefulness, contentment, community …and simplicity! Life was penetrating and enchanting without the effort. I had the opportunity to perform in an atonal opera delivering a message on forgiveness. It was the first time I experienced an audience emotionally moved to tears through the medium of performance. JC: Where do you pull from for your inspiration for your projects? TS: My work usually embraces a less literal approach, being driven by a dark emotional force but expressed in a playfully juxtaposed display of my current interests in music, colors, fashions, landscapes and aesthetics. I like to source components that are under promoted, undiscovered, and bring them to light in a platform that is approachable. JC: Is it internal mostly or external? Or a mixture of both? TS: Both. I am visually and emotionally motivated. Whether they express the same things is irrelevant to me. I may like yellow even though I am entirely depressed. JC: You have a BFA in dance from Florida State University. What can you say about that experience to describe it? TS: I finished my last two years of my Bachelor’s at FSU so I had a somewhat intensive approach to the curriculum, as if I were at a conservatory. It was dance all day, all night. FSU was strongly influenced by the Graham Technique making for a fundamentally rich and technically driven training program. I also was a member of an improvisational dance company under the direction of Lynda Davis that heavily influenced my diversity as a professional dancer. When I arrived in NY, FSU was nationally honored as a top program but very disconnected to the NY and European dance scenes. I had to be extremely versatile; an inimitable scribble. JC: What projects are you current working on? TS: Trilogy of Two, a series on twins I have been working on since 2005 is now ready for presentation. 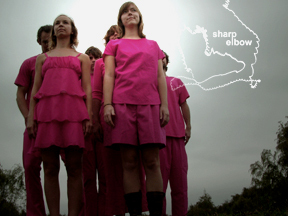 Pink is a work-in-progress where I gather footage in several scenic locations with a group of pink pedestrians. This year was Norway and Brooklyn. Last year was Paines Prairie in Gainesville, Florida. JC: When did you make the transition into working with video? TS: In 2005 I had an idea for a video which became Lovebirds. I had been performing a lot of site-specific dance and video elements were always present and influential. Meanwhile, dance itself was taking a turn in NY by needing to be more accessible to its audiences. Site-specific dance was becoming overdone. I was also hanging around many computer savvy people, like my digitally genius brother. I always liked the format of music videos and how powerful they are in selling the music, so I started there. JC: Who are the actors or performers in your videos? TS: It varies. Dancer Einy Aam and I are featured in quite a few. However, I have been working with random groups of people on many projects; most are not actors or performers, just friends. One commissioned video, the subject matter was an installation of hanging hoods. JC: Do you work with the same people on your projects or does it vary from project to project? TS: I try to stick with the same crew. Obviously, each project is its own. JC: Do you do your own video editing and compiling? TS: I have. I have also sourced that out. I work a lot with Jessye McDowell in NC. JC: Where have you shown your videos? TS: Dance Theater Workshop, Bushwick Starr, J Mandle Performance, SpikeTV, Myspace. TRACE Magazine has run a feature, as well. JC: Your web site is www.sharpelbow.com. Where did you get that name? TS: I elbowed someone in a cut-throat game of hang-man. JC: What artists that you know personally have you been inspired by? TS: Julia Mandle has been a long-time inspiration and mentor, as well as, Michelle Handleman, Beppie Blankert, Matt Morrow, Eric Jackson Bradley, Jessye McDowell, Darrin Bennett, my beau Darren Kucera. Byron King!!! The list can go on…..
JC: And to follow up on New York, how have the neighborhoods changed in the last nine years since you’ve been there? TS: Everything changes here constantly. It goes from being a good idea to overstated and exaggerated very fast. So people pick up and start again somewhere else. On, and on the cycle goes. I have stayed in Park Slope, watching it go thru this. I will continue to stay, though, because of the birds in my backyard, sun in my apartment and the dudes at the 5th Ave bodega. Eventually the baby buggies will get smaller again. JC: What are you planning to work on in the near future? TS: Sharpelbow just became an LLC and I have two possible videos in collaboration with musician Bradley Kemp and the other with folk-singer Tori Sparks (ironically). JC: Any words of advice for dancers / artists who are just starting out and are wishing to move to New York? TS: Learn the meaning of contentment, seriously. Be diligent. Be smart. Go out and meet new people, “be” in the city. But also build upon the community you already have. You may find you already have everything you need. And when in doubt, do more yoga. Thanks Mark. Appreciate you sharing Tori. Way to flipping stick it out in New York. I remember when I used to go to your performances and how they really did expand my horizons on contemporary dance and performance art. I was so honored to have been able to be your friend those few years. I’m so excited to see you go into video and look forward to what you create in the future. Definitely, do more yoga. Wise words.